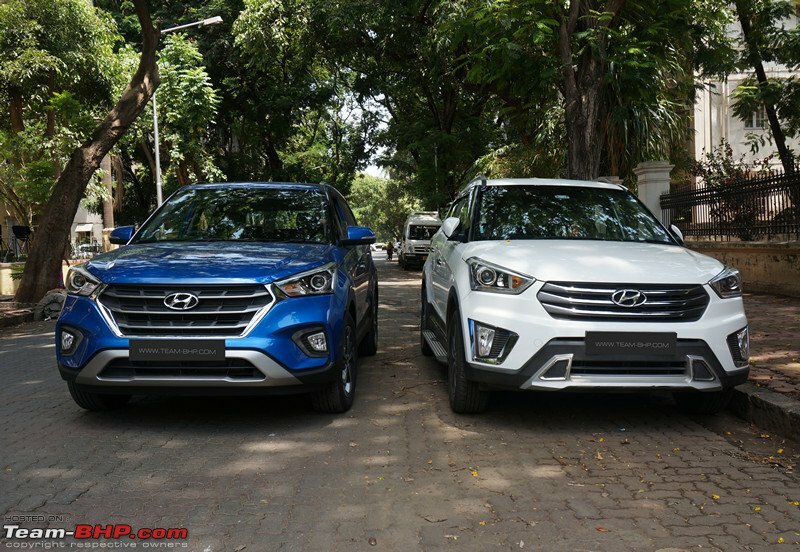 There are other issues with Hyundai now since they know Creta is already selling well and their sales people too are cocky about it. Now I'm not sure if the delivery will happen on July 11. He sure spoiled my thrill and excitement of a new car..! Irony is that I'm a repeat customer; upgrading from a Grand i10 to Creta. Last edited by Indicruz : 9th July 2018 at 20:52. Booked a White Creta SX AT on July 3rd . The SA has mentioned a wait period of 2 weeks in Kerala , Looking at the wait times I am worried that they are not going to make the delivery date . Also they discounted 10K for taking insurance with them . Guys, I just got an update from HMP. It appears Hyundai is making a feature refresh and they've stopped manufacturing models with current features. Since HMP doesn't have a yard (they order vehicles only after booking and brings it from the factory a day or two before customer delivery), they asked me to wait for another 10 days. Sales guy said that the model I booked (SX Petrol AT) is getting wireless charging. He is yet to get an update on any other features that are being added. Last edited by Indicruz : 10th July 2018 at 10:50. Do you know its just Wireless charging or any other features are going to update on SX AT variant? As per him, it's just wireless charging. However, I'm wondering what's this urgency to add wireless charging in SX variants? There are several other better features omitted and they could have added any of those or rather just give SX(O) AT! Hyundai definitely needs a special mention for their feature deciding capability! Great review as usual. Planning to book the SX AT soon. Any inputs on the PDI ? Does anyone have a check list? When I & Moralfibre reviewed the Creta in 2015, we knew that it will be a success. But such a blockbuster success? Fascinating. I don't think even Hyundai expected its million+ rupee crossover to sell 9,000 - 10,000 copies a month. It's an unprecedented blockbuster of the 10+ lakh segment. The lack of any formidable competition certainly helps - there's no alternative from Maruti (no skills to develop such expensive cars), Honda (lack of focus) or Toyota (too slow). Drive the Creta and it's easy to see why people buy it. This Hyundai is an all-rounder. I think the styling is what draws people into the showroom (women l-o-v-e the Creta too, so husband + wife automatically in agreement). Once in the showroom, a simple test-drive and the deal is sealed. The refinement is impressive and so are the engines. It's got a long list of variants, engine & transmission options. Pick & choose based on your budget & requirements. I have a bone to pick with Hyundai though. The Korean company has always been at the forefront in providing features, be it the new Verna & its ventilated seats or the 1st-gen i20 and its 6 airbags + rear disc brakes. But man - the Creta is perhaps the only Hyundai where the company is counting its pennies. Just look at the number of missing features that you would take for granted at this price point (auto-folding ORVMs, telescopic steering, rear disc brakes, LED headlamps & tail-lamps, auto headlamps & wipers, vanity lights on the sunvisors, illuminated power window buttons, gas struts to hold the bonnet, paddle shifters on the AT….the list goes on). What makes it worse is that the cheaper Verna gets some features (e.g. ventilated seats, hands-free boot) that the Creta doesn't. Why do this to your most important car, Hyundai? One more feature is missing I think, the retractable grab handles. Even the old 1st gen i10 had it. God and Hyundai management knows only what F-A-T profit margin is got from Creta. Cannily HMIL understood the mindset of Indian customers as well as the drawbacks of the competition and made Creta their cash cow. Even I would pick the Creta any day eyes closed over the Duster, Terrano, BRV or Captur. The only formidable opponent to Creta would be the Grand Vitarra, if MSIL ever decide to bring it to India with considerable localization. Any way to deactivate the irritating horn sounds while locking and unlocking? Sounds hellish in our quiet society! Apologies, bumping this up myself. Fantastic review. Thank you! btw, is the older version is tad taller than the new one ? Can be done via OBD is what I think as this option was/is in a VW to a Mahindra. VAG cars had an option to deactivate via OBD. In few international forums, people suggested to try different combinations like "hold the lock/unlock button for few seconds" etc. Do check those and try it. Height is same since there is no change in the structure. The older generation is looking taller here because of the blue colour of the new generation that is blending into the background. Darker colours hide the stance of any car. White vs white would give you a better picture. I cannot agree to this point when considering Creta. My Creta has run 55K KMS and the clutch was replaced 4 times so far. When the service engineer tried convince me that it is a driving style issue, I challenged him to give me the best driver he has for 15K kms drive within Bangalore city (I drive 40 KMS per day in peak traffic) and prove that it is the driving style issue. My point is that the diesel clutch in Creta cannot withstand heavy traffic conditions beyond 15K KMS however best you drive. I have owned Swift and clocked 90K KMS with just one clutch replacement at 80K KMS. So it is the same driver with a different car. Only the car is the problem here and not the driver. Any update on this, as I also booked the petrol automatic and schedule to be delivered in next 10 days? All times are GMT +5.5. The time now is 18:27.